Summer's slowly coming to an end (if you live in Belgium, abruptly), which means it's almost time to say goodbye to all that beautiful summer fruit. While last summer was my summer of watermelon, this summer I've been gorging on peaches and nectarines. When I woke up this morning all I saw was rain and grey clouds, so I decided to create an ode to summer with my breakfast. It was an on-the-spot improvised thing, but it's super delicious (though maybe not the prettiest) and so easy to make. Definitely a good recipe to try this weekend! Blend the pancake ingredients until you have a smooth batter. Take a large pan, put it on medium heat and melt half a teaspoon of coconut oil in it. Pour little rounds of batter into the pan, I do 4 little pancakes at once. When the top sides of the pancakes are no longer liquid it's time to flip them, and fry for two more minutes. Repeat until there's no more batter left and you've got a couple stacks of banana pancakes. Slice the nectarine into bite-sized pieces. 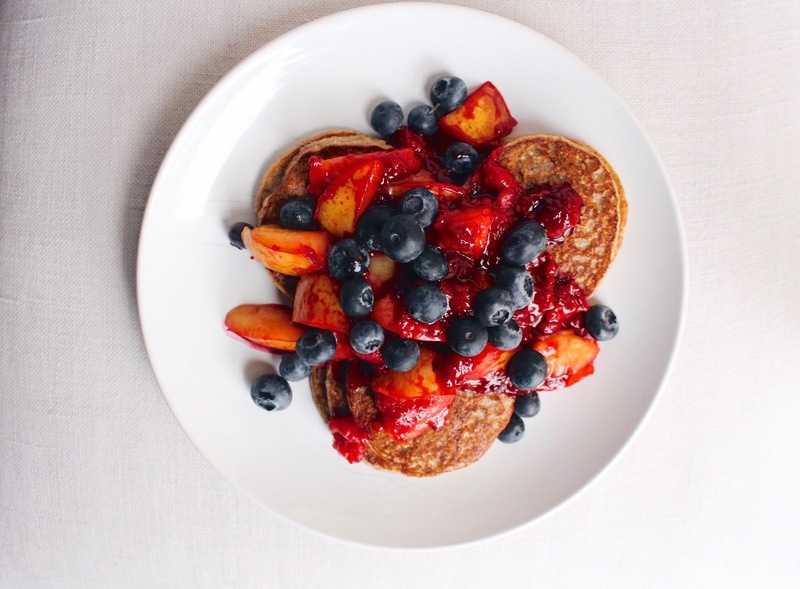 Add a little coconut oil to the same pan you used for the pancakes, and fry the nectarine and raspberries until nicely softened (about 4 minutes). Pour the "compote" over the pancake stacks, add a handful of fresh blueberries and finish off with a drizzle of maple syrup if desired. Bon appetit!